THE DIALOG WITH SANAT KUMARA, AND THE UTUBE VIDEO. AND THAT IS STILL SHOWING UP ON GOOGLE PAGE. Experience: 14+ Years of Extensive Computer Repair Experience. Hi and welcome to Just Answer, a Question and Answer Company. My name is XXXXX XXXXX I will be assisting you today. Can you explain a little more in detail about what you mean by 'On Google Page'? 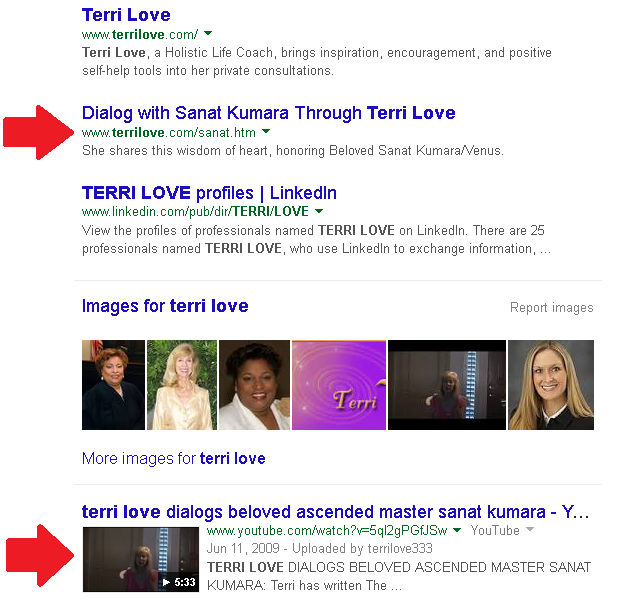 Yes, when I put in through Google, Terri Love, my website is there. I would like to have both of those lines removed from Google Search. Are you referring to these two lines? Yes. Can you remove them from Google Search? To remove the Youtube Video from Google, you will have to signin to your YouTube Account that has that video and change it from Public to Unlisted. To remove the other link, you will have to tell Google not to index it. This can be done using a robots.txt file or removing the link in Google's Webmaster Tools after the URL has been verified. I would need your login credentials for a few things to do this for you but because your Question value is very low, we would need to agree on a fair price for this additional service as it will take a little time. I have incorrect information listed when my name is searched.